Only rank-and-file workers can build a better labor movement. 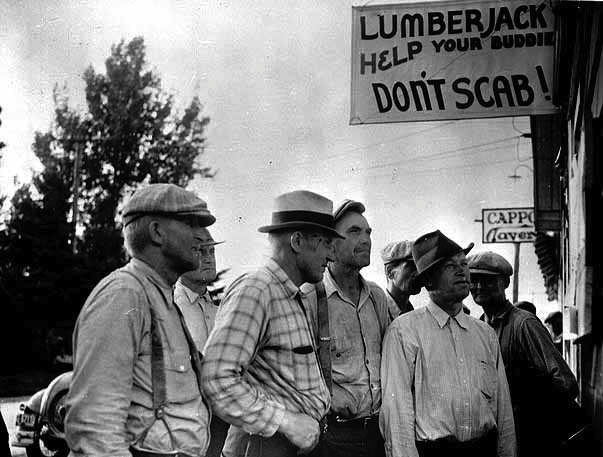 Michigan timber workers reading the bulletin board at strike headquarters in 1937. Ted Fertik is terrified by the possibility that US unions may soon lose the agency shop. I don’t blame him — it’s a pretty scary prospect. Most unions today are not well positioned to mitigate the potential impact on their organizational and financial wherewithal. If the recent experience of AFSCME in Wisconsin is any guide, they should expect to see a substantial portion of their membership base evaporate more or less overnight. Income from dues and fees would be drastically reduced, and unions would struggle to fund many of their current day-to-day activities. I certainly don’t relish the thought that this could happen sometime in the very near future. Despite these completely valid fears, one should not make the claim, as Fertik does, that “the possibility of the demise of the Wagner Act might mean the demise of worker organization tout court.” To begin with, the end of agency shop would not spell the death of the Wagner Act, which would still allow workers (union and non-union alike) to engage in protected concerted activity, as well as the recognition of members-only unions. More importantly, his claim is based on the fundamentally flawed premise that laws or unions create workers’ movements, when it’s really the other way around. I don’t say this out of any kind of misplaced “romanticism.” There is a mountain of historical evidence to support this view. The 1930s upsurge, for example, was initiated and led by a militant minority of workers — many of them Communist and Socialist Party cadres — and their efforts were the driving force behind the organization of the CIO and the revitalization of the AFL. In his definitive study of union growth, labor economist Richard Freeman argues that the explosion in union membership during the period was primarily a bottom-up, not top-down, process. Most of the new unions were organized not through the National Labor Relations Board election process, but through strikes that forced employers to recognize and bargain with them. And many of those strikes occurred after the 1935 passage of the Wagner Act, suggesting that they probably would have happened even if the act hadn’t been passed and upheld by the Supreme Court. Further, he shows that most of the substantial organizing was done by local unions and autonomous workers, not the central CIO institutional apparatus. As Freeman concludes, “the lesson from the depression experience is that bottom-up employee-driven bursts of union activity rather than particular laws, are necessary for any resurgence of union density.” A similar dynamic prevailed during the wave of militant worker self-activity that drove the organization of the public sector during the 1960s and 1970s. Fertik’s more specific claims don’t bear much scrutiny either. He argues that the sorts of comprehensive campaigns favored by SEIU and UNITE-HERE are still the key to making gains for workers. But unions have been doing comprehensive campaigns for decades, and private sector union density hasn’t stopped its precipitous decline. Unions should reinvest those resources in rebuilding their internal organizing capacities and developing shop-floor leaders among the rank-and-file. Fertik seems to think that the act of paying union dues on its own constitutes some organic experience of solidarity. But just because a worker pays union dues doesn’t mean that she has any experience of solidarity or collective action. Most unions don’t do any meaningful internal organizing, and most members are disconnected from the organization they’re nominally members of. To a significant extent, that’s because the current model based on agency shop plus exclusive representation offers union leaders every incentive to do little else besides collect dues from their fiefdoms and maintain the status quo. There are important exceptions like the Chicago Teachers Union (CTU), but they’re really very rare. For every CTU there are scores of moribund local unions that would have trouble surviving if they had to actively demonstrate their value to the members. The twilight of a particular organizational form should not be confused with the end of worker organization itself. Institutions are not permanent, but workers’ interest in organization is. And besides, the current model is disappearing whether we like it or not. All things being equal, I would prefer to keep a reformed version of the current model, with the CTU being among the best examples of what that would look like in practice. But the unions we have don’t appear to be up to the task of defending the legal-institutional structures they need to survive in their current form. Preserving them depends on organizing the already organized, but decades of internal atrophy mean that unions may not have the personnel and the skills necessary to do so in the time we have left. The loss of agency shop would be a serious setback for the labor movement, at least in the short term. But it doesn’t need to be a fatal blow. It would force unions to do lots of things very differently and put a premium on building strong workplace-based organizations so the remaining members see the value in paying dues voluntarily. There is certainly no “straight path” from the end of the old model to a new upsurge of worker organization and disruption. The prospects for worker self-activity may currently look bleak, but we should not forget that almost nobody anticipated the upsurge of the 1930s before it happened. Most informed observers thought that unskilled mass production workers, divided as they were by race, ethnicity, language, and national origin, had no hope of organizing themselves to fight powerful companies like General Motors. Then as now, a new labor movement will arise when workers themselves want it and take action to make it a reality. I have no idea when that will happen — none of us do. But it won’t come from the current unions and their staffers, no matter how smart and well intentioned we may be.